Daimler's earnings before interest and taxes (EBIT) dropped to 3.34 billion euros ($4.03 billion) in the first quarter from 3.77 billion in the same period last year. The automaker said operating profit was 12 percent lower because of foreign exchange effects and the absence of one-off gains. Results in the year-earlier quarter were boosted by the reversal of an impairment of Daimler's equity investment in BAIC Motor and the valuation of a stake in digital mapping firm Here. Net profit for the quarter at 2.35 billion euros was significantly below the prior-year figure of 2.65 billion, the automaker said in a statement Friday. Daimler's Chief Financial Officer Bodo Uebber said the company now expected a burden on earnings this year in excess of 1 billion euros tied to currency effects and the strong euro. Foreign exchange effects also hit earnings at French rival and alliance partner Renault and auto supplier Continental which also reported first-quarter earnings on Friday. Daimler said the euro's strength relative to the Chinese renminbi, Turkish lira, British pound and yen caused them to revise their estimate for foreign exchange impact upwards, albeit not to the extent that it could force a change in earnings forecast for the year. "We believe the company is well on track to meet its 2018 outlook for a slight increase in earnings before interest and taxes (EBIT)," Evercore ISI analyst Arndt Ellinghorst said in a note. The firm added on Friday that Daimler increased estimates for raw material headwinds to 500 million euros in 2018, up from 300 million, and now sees foreign exchange causing a 1.3 billion euros hit. Another factor Daimler faces is consumer backlash among diesel buyers in Europe. The technology's struggles since Volkswagen Group's emission-cheating scandal in 2015 have intensified as German buyers worry about potential driving bans in cities. 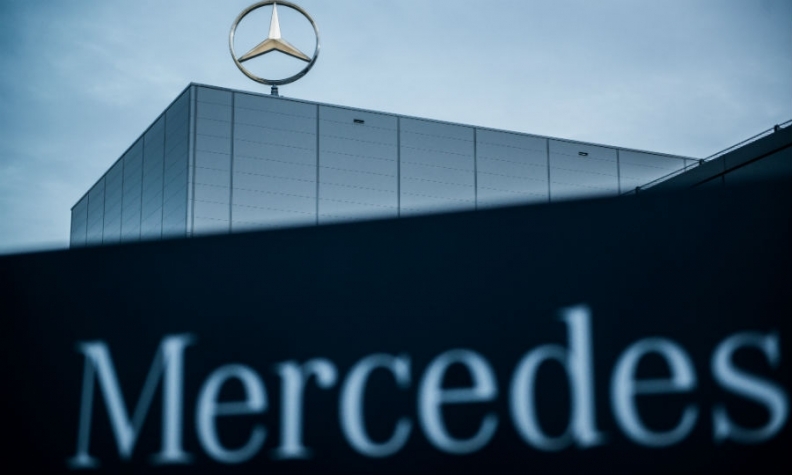 The resulting drop in expected used-car prices prompted Daimler to take a charge of 100 million euros on the value of its lease book, CFO Uebber said on a conference call with reporters. The return on sales at its Mercedes-Benz Cars division inched up to 9 percent in the quarter, from 8.9 percent a year earlier, thanks to a 5 percent increase in car sales to 594,299 vehicles. Daimler struck an upbeat tone for full-year earnings as sales growth of higher-priced Mercedes cars offset increased spending to develop electric vehicles. Earnings will increase “slightly” this year both on a group level and for the carmaking division, Daimler said. The previous forecast was for no growth this year. “We are sustainably continuing along our profitable growth course,” CEO Dieter Zetsche said in the statement. “We aim to continue building on this and will systematically implement our strategy” to boost sales while adapting to industrywide technology shifts. Mercedes posted its best quarterly vehicle sales ever, with deliveries of the GLC crossover jumping 33 percent and the revised flagship S-class sedan posting a 29 percent gain. Daimler is developing a line of 10 all-new, full-electric models under the EQ subbrand to go on sale within five years. The company is also initiating a corporate overhaul, a task potentially complicated by Chinese automotive billionaire Li Shufu’s purchase of a 9.7 percent stake early this year to become Daimler’s largest shareholder.